"A compelling novel that explores friendship and conflicted morality in a realistic, unique and spellbinding style. Highly recommended!" The Columbia Review. “Once We Were Friends” by Bryan Mooney is the story of two boys, Davey Malloy and Timmy Walker, who grew up in the Midwest sharing a wonderful friendship, as well as a budding affection for Sun Lei, a young immigrant girl from South Korea. We spend a summer with them at age twelve and see the seeds of their adult lives and choices being planted—both good and bad. We also share their worlds as adults, with Timmy in a world of crime and bad company, and Davey serving in the police force and becoming a successful author. And, as things often happen in real life and in fiction, the past comes knocking, and painful consequences soon follow. The novel is a truly unique combination of a coming of age story, a boys-to-men tale, a friendship-to-conflict drama, and a nostalgic, sweet romance mixed with harsh realism of growing up good—or bad. To tell this ambitious yet very human story, prolific author Bryan Mooney (“A Box of Chocolate,” Christmas in Vermont”) chose an exceptional form: while the main thrust takes place over one day, much of the background events are introduced via flashbacks. But don’t let this highly creative structure scare you, because if you enjoy Nicholas Sparks and Paula Hawkins, Bryan Mooney’s fiction would be the real deal for you. This is not just us saying; Amazon’s own algorithms prove it. 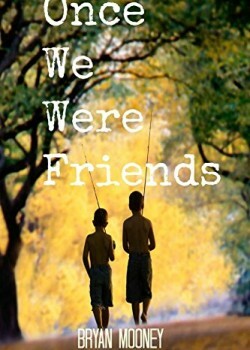 In summary, “Once We Were Friends” by Bryan Mooney is a compelling novel that explores friendship and conflicted morality in a realistic, unique and spellbinding style. It will keep readers interested from beginning to end, not only because of the author’s natural talent at creating suspense, but also due to the characters’ believable emotional depths and the genuine conflicts that draw us in and keep us turning pages to the very end. Highly recommended!